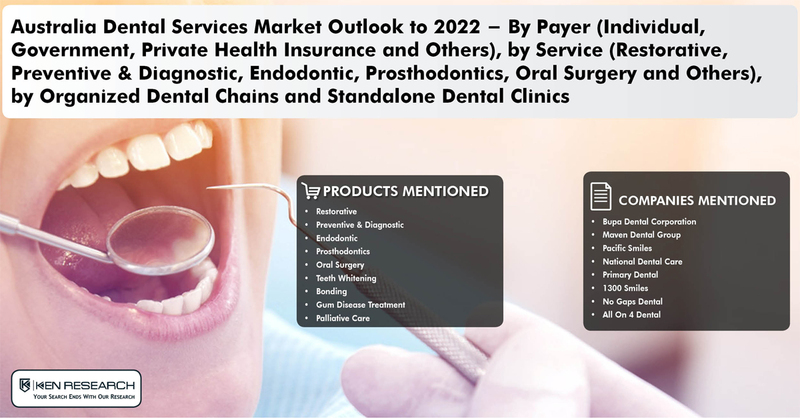 Rising dental service fee, per capita dental expenditure and growing pool of dental practitioners to aid growth of Australia Dental Services Market in the mid-long term. An incline in dental visit by Australians driven by rise in general awareness for dental health and prevention and growing unhealthy food habits resulted in increased market revenues during the last few years. The number of dental practices in the country recorded grew at a steady pace during FY’2012-FY’2017 which augmented dental clinics visits in the concerned period. The report titled ”Australia Dental Services Market Outlook to 2022 – By Payer (Individual, Government, Private Health Insurance and Others), by Service (Restorative, Preventive & Diagnostic, Endodontic, Prosthodontics, Oral Surgery and Others), by Organized Dental Chains and Standalone Dental Clinics” by Ken Research suggested that the Australia dental services market is anticipated to grow at a CAGR of 3.6% during the period FY’2017-FY’2022. Private health insurance funding continued to witness an incline from AUD 1,181 Million in FY’2012 to AUD 1,876 Million in FY’2017. This represented growth at a CAGR of 9.7% during FY’2012-FY’2017. Growing private health insurance coverage largely stimulate market growth as patients are willing to visit dental clinics on a more frequently and undergo expensive procedures since part of it is funded by insurance funds. Furthermore, number of dental establishments and dental service fees recorded low single digit growth during the last 5 years. The number of registered dental practitioners grew at a growth rate of 3.0% during FY’2012-FY’2017 which had a positive impact on Australian dental clinics market. High service fee of dental services in the country is a growing concern. Rising cost of dental services in the country has led to quite a large number of people avoiding or delaying dental visits. Survey data from Australian Institute of Health and Welfare showed that about 32% of the population aged 5 or older (11% of children aged 5-14 and 45% of adults aged 25-44) avoided or delayed visiting a dentist due to high associated cost. Additionally, the survey also found that cost of treatment prevented about 25% of adults and 6% of children from having their recommended treatment. Bupa Dental Corporation, Maven Dental Group, Pacific Smiles, National Dental Care, Primary Dental and 1300 Smiles are the major dental chains operating in this space in Australia. However, these dental chains will witness rising competition from existing organized and unorganized clinics and new entrants providing cheaper services in the market.